Today’s top story is a history lesson, on disasters since 1960 that tell of human impact on the natural world. Meanwhile, looking to the future, a couple of articles about looming climate impacts and cautions to prepare; cities around the world sign up to be net carbon zero by 2030; and the future of plastic looks bleak. Also, is Indonesia’s palm oil industry feeling the pinch of consumer aversion to palm oil? Mongabay describes a pitch the government has made to have planes flying on biofuel from palm oil. The birth of industrial civilisation in the 18th century meant humans could extract, transport, and process ever more of nature’s bounty, permanently affecting natural cycles. As we navigate the Anthropocene, the much-debated geological epoch that recognises the geological and ecological impact of the industrial age, there are several environmental disasters and crimes that should be taught in schools to educate young people about the human impact on our shared planet. AUSTRALIA – Sea level rise is already threatening some communities around the world, particularly small island states, as it exacerbates disasters resulting from storm surges and flooding. If greenhouse gas emissions continue unabated, by 2100 the world could see sea level rise of a metre — or even more if there is a larger contribution from the Antarctic ice sheet, as some recent findings suggest. Even without a larger Antarctic response, the rate of rise at the end of the 21st century for unmitigated emissions is likely to be equivalent to the rate of rise during the last deglaciation of the Earth, when sea level rose at more than a metre per century for many millennia. For all scenarios, sea-level rise will continue for centuries to come. Most species face multiple threats that together play a role in observed species declines. To reduce or reverse these declines, conservation plans need to allocate management actions across multiple threats and prioritise actions for the threats causing the biggest declines. However, managers are often faced with the problem of limited knowledge regarding which threats are causing the biggest declines in species and limited resources to manage the threats are prevalent in the system. NEW ZEALAND – If the brown marmorated stink bug establishes a foothold in New Zealand it will face a tiny but lethal opponent. The Environmental Protection Agency has pre-approved release of a traditional foe of the stink bug, the pin-head sized samurai wasp. It is the first time a bio-control measure has been approved in New Zealand before an incursion has taken place. NEW ZEALAND – The impact of farming, forestry and climate change on our lakes has been captured by four years of satellite observations. The first comprehensive assessment of lake water colour, led by the University of Waikato’s Dr Moritz Lehmann, revealed the full global range – some being a stable blue, some varying strongly through the seasons, and others suffering the effects of man-made pollution. Indonesia wants the U.S. and France to let Indonesian companies build palm oil jet fuel plants in the Western countries. Indonesia’s trade minister said he had conveyed this request to the U.S. and French governments, and made it a condition for future purchases of Boeing and Airbus planes. The request comes amid a wider campaign by the Indonesian government to prop up demand for palm oil, of which it is the world’s top producer. The EU carbon price has broken €20 per tonne for the first time since 2008 this morning, as impending reforms to the market drive speculators and businesses to stockpile allowances. The price of carbon emission permits under the EU Emission Trading System (EU ETS) has risen 156 per cent this year, and more than quadrupled since May 2017 when a tonne of carbon was priced at just €4.40. The surge means carbon allowances are currently the year’s best performing commodity. AUSTRALIA – Product stewardship consultancy Equilibrium has been engaged by Sustainability Victoria to examine the options for dealing with a looming solar PV waste issue. As part of the initiative, the consultancy is reaching out for input from solar manufacturers, installers, project developers, the energy industry, peak bodies and others to inform the development of options. An online survey is being conducted seeking stakeholder views. I’m not easily impressed by advances in sustainable business — I’ve been watching them happen in fits and starts for three decades — but I’ll confess to being astounded by what’s going on these days in the world of plastic. Or, more to the point, plastic waste. And no, it’s not just straws. Indeed, that may be the least of it. I’ve been spending a lot of time lately talking to activists, brand owners, polymer companies and others about what I call “the war on plastic waste” — where we are, how we got here and where things might be headed — for a story I’ll be reporting next month. I can tell you without reservation that opinions about the future of plastic are all over the map. 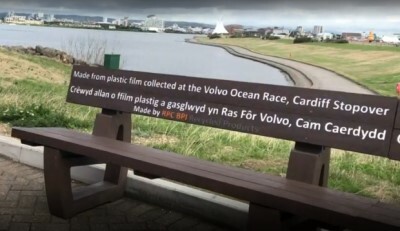 UK – Plastic waste from the Volvo Ocean Race stopover in Cardiff has been collected, recycled and transformed into benches. The Volvo Ocean Race is a 45,000 mile stretch across the world. At this event using plastic is almost unavoidable. This year, they decided to work with RPC bpi Recycling, the largest recycler of polythene in Europe, to highlight the creative and business potential of recycling plastic. At the Cardiff stopover they collected 1000kg of plastic and enlisted the help of a local factory to recycle it. The heavy-duty ‘plaswood’ benches they produced make perfect outdoor seating. As Mexico emerges from the most violent election campaign within living memory and embarks on the presidency of Andres López Obrador, one prominent citizen watches at a diagonal: a veteran of Mexico’s other war – not that over narco-traffic and its clients in politics, but that against nature. In a recent interview with the daily El Universal, Homero Aridjis – award-winning poet and former ambassador – described all the candidates at last June’s election as “environmental illiterates” – referring to the battle he has fought for decades now, and which he sees reaching its final stages – for Mexico’s natural and cultural heritage. AUSTRALIA – With the apparent combustion of the Turnbull government expected on Friday, the parallels with Emperor Nero supposedly playing his lyre as Rome blazed around him are unmistakable. Having our federal political leaders consumed with the Liberal Party’s infighting is precisely not what’s needed for our country. Just ask agencies battling to prepare for real-life conflagrations that threaten the eastern seaboard in coming months. NIGERIA – For Rhoda Tanko, preparing dishes of okra or egusi soup in her small shack was a daily ordeal spent battling the dizzying, toxic black fumes spewed out by her charcoal stove. “Every time I had to cook for my family, I knew I had to deal with smoke that made my head feel heavy and my eyes swim,” Tanko, a 38-year-old mother of four, told the Thomson Reuters Foundation in the central Nigerian town of Jengre. AUSTRALIA – An economically-sustainable hydrogen industry could soon be on the cards according to a blueprint released by CSIRO, the national science agency, which found that cost competitiveness is firmly on the horizon. AUSTRALIA – The Queensland government has announced it will provide up to $3.1 million for a feasibility study into a proposed $2 billion lithium-ion battery “giga-factory” in Townsville. The idea is being promoted by an international consortium known as Imperium 3 – led by Boston Energy and Innovation, Magnis Resources and Charge CCCV LLC. A smaller “giga-factory” has also been mooted for Darwin. The global green building sector received a major boost today, as 19 cities that together provide homes for 130 million people pledged to make all new buildings ‘Net Zero Carbon’ by 2030 and upgrade existing buildings to net zero standards by 2050. 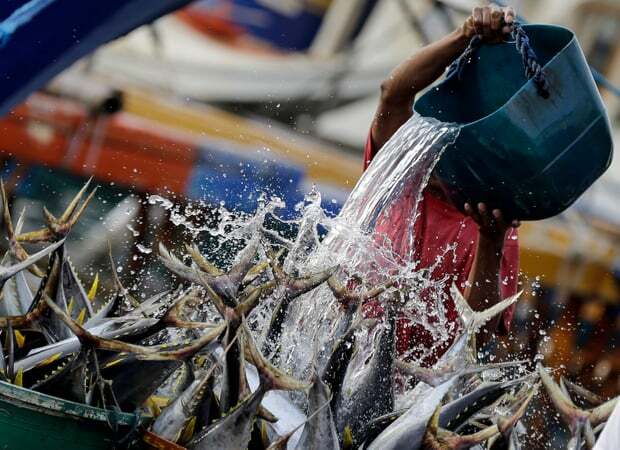 PHILIPPINES – Raul Gomez is an old man who fishes with five crew on a clipper in the seas known as the coral triangle, and he has spent two months now without taking enough to feed his family. Riding out storms and searing heat in western Pacific waters, the burly, sun-inked Filipino uses a pole and line to reel in yellowfin tuna the size of an adult human. This has been his trade for 40 years, but it is becoming tougher as fisheries in this region – one of the planet’s most important centres of tuna production – face the prospect of total collapse.